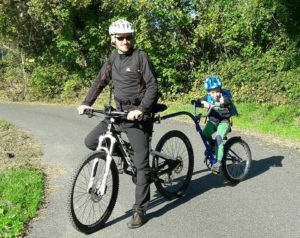 Family by bike: a fun day out for the whole family by e-bike to discover medieval villages, castles and beautiful landscapes in the Apennine National Park. Depart from the beautiful Romanesque Church of Sorano in Filattiera, landmark along the pilgrimage route Via Francigena. Cycle along secondary roads to the medieval Malgrate Castle, with its imposing 25m tall tower commanding the whole valley of Lunigiana. We continue towards the quaint village of Bagnone where we can stop for a walk along the arcades of its historic center and the charming “Ponte Vecchio”. When it’s season, stop to refresh in the pristine river Bagnone boasting spectacular natural pools. This activity can be booked on request on a private basis. Meeting: 9:30 Tourist Information Office Pieve di Sorano, Filattiera, Via Ponte Provinciale 64 (next to the Romanesque Church). Tour ends approx. 13:00. Difficulty: easy (19 Km) suitable for kids 1+ yrs old. Price (min 8 people): 20 euro adults, 12 euro kids 4 – 12 yrs old, free under 3. Price includes English speaking tour guide, e-bike rental and kids accessories, Malgrate entry fee, insurance.